We're in the midst of a self-imposed hiatus from writing new blog material, as we're busy hustling behind-the-scenes on our first full-length book. But rather than suffer through total radio silence, we thought it would be fun to periodically revisit old articles we've published over the years, many of which are no longer available online. The following, written by Chris, originally appeared in Hush Magazine on October 23rd, 2013. The United States Postal Service caused uproar earlier this month, when they released a series of stamps designed to encourage physical fitness among their nation’s chronically inactive children. In the end, they were forced to destroy the entire run of fifteen stamps, over outcry about some of the ‘unsafe’ activities that they depicted. These include the wild and irresponsible acts of performing a cannonball into a swimming pool, doing a headstand without head protection, and skateboarding without kneepads. Not to be outdone by our southerly neighbours, Parachute Canada recently published a laundry list of bicycle safety tips for kids, including dozens of recommendations about protective gear, reflective clothing, and this puzzling piece of advice: "Children under 10 should not ride on the road. They do not have the physical and thinking skills to handle themselves safely in traffic.” In the world according to Parachute, daily cardiovascular exercise with my four- and seven-year-olds on the traffic-calmed streets of East Vancouver is tantamount to child endangerment. Our neighbourhoods belong to the automobile, and less – not more – roaming children is the only way to keep them safe. I wish this type of misplaced concern still surprised me, but it doesn’t. Instead I watch in frustrated bewilderment as our society attempts to legislate and safeguard itself from every imaginable risk, however small. At the same time, we utterly fail to address the root causes of these preventable injuries, while disrupting what should be healthy and playful lives, and ultimately, an irrational culture of fear ends up endangering us all. When it comes to two-wheeled travel, our children aren’t the only ones exposed to excessive fear mongering. 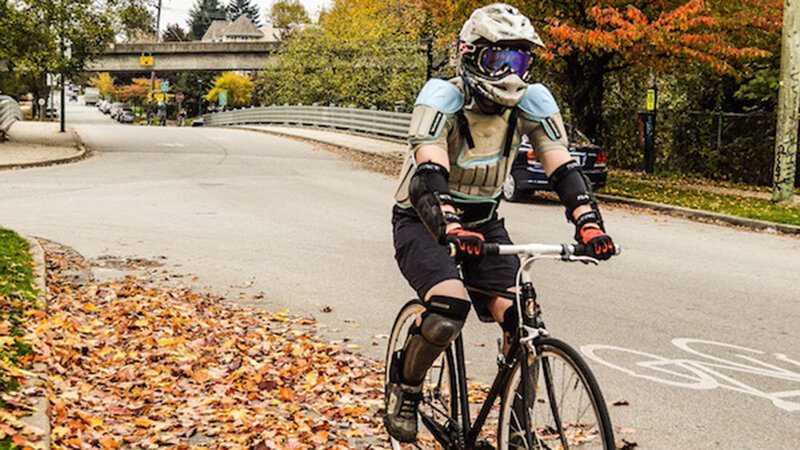 Not content with cyclists dressing up as construction workers (including the requisite hard hats and high-viz), trauma surgeons from Foothills Medical Centre are now recommending that Calgarians don body armour while riding in the city. Never mind the fact that the good surgeons have no comparable suggestions for the remaining 98% of their patients (motorists, pedestrians, etc.). Never mind the fact that they’ve never actually tested this unproven technology. And we’ll overlook the fact that, statistically, a bulletproof vest would see as much action in Alberta as a cyclist’s chest pad. No, leaving aside all of that crazy ‘factual’ stuff you would hope these scientists might ponder, let’s just consider the psychological impact that promoting chest (and head) protection has on both existing and potential bicycle users. It is to accept that collisions are inevitable, that the only available course of action is padding and more padding, and a vain attempt to mitigate their damage. That simply isn’t good enough. This contrived perception of danger is, in many cities, the single biggest barrier to the widespread uptake of utility cycling. By implying that a blow to the head or chest is unavoidable, we suppress numbers to only those willing to armour up, and scare the vast majority of our risk averse citizens onto other, less active modes of transportation. In reality, there is far more safety in numbers than Styrofoam, which is why cities around the world with the highest cycling rates are also the safest, irrespective of helmet usage. Furthermore, the mistaken sense of invincibility provided by safety gear drastically changes the dynamic between road users, and not in the favour of the cyclist. Armoured cyclists have been statistically documented to indulge in ‘overcompensation’, taking additional risks, riding quicker and more recklessly than they otherwise would. Similarly, in a scientifically proven phenomenon known as the Mary Poppins effect, motorists also conduct themselves differently around cyclists dressed in protective equipment, leaving less space when passing, and travelling notably faster around them. It is through these three behavioural patterns (safety in numbers, risk compensation, and the Mary Poppins effect) that the handful of global jurisdictions (alas, including beautiful British Columbia) who pay police officers to enforce bicycle helmet wearing are, in fact, making those who do take to the streets more likely to be struck by a motor vehicle. A politically correct emphasis on safety equipment also fails to consider or address the unavoidable fact of human error and laziness in the equation. A typical bicycle helmet, for example, has dozens of guidelines that must be followed in order for it to be 100% effective: it must be certified, fitted and strapped correctly, and positioned properly on the skull. It must never be dropped more three feet, must be replaced every two years, and must never be worn over a hat or hood. Breaching any of these strict conditions effectively renders the helmet useless, and given both cyclists’ and motorists’ habit of risk compensation, results in a scenario far more dangerous than riding without one. Focusing on the attire of the most vulnerable users of the road also distracts us from the serious policy discussions we need to have, in order to truly democratize our streets. Baseless speculation over safety gear is happily promoted by doctors, politicians, and the media without question, while meaningful initiatives proven to prevent injuries – such as dedicated cycle tracks, bike-share schemes, speed limit reductions, and heavy goods vehicle restrictions – are stirred up into manufactured controversies. Take Paris as a shining example, who swiftly executed each and every one of these measures in the last five years, effectively doubling the number of bicycles on their busy streets, and – despite helmet usage of around 2% – didn’t experience a single cycling fatality in 2011. Once, just once, I’d like to see a police or medical professional courageously call for the taming of the bull in society’s china shop, not just the bubble wrapping of our fine china. Underlying each and every one of these issues is obesity epidemic that shows no signs of slowing down. 93% of Canadian children do not get the recommended hour of daily physical activity. One in three are either overweight or obese, a vicious cycle that proves difficult to break as they enter adulthood. By 2040, almost three quarters of Canadian adults will be overweight, significantly increasing their risk of heart disease, cancer, stroke, type 2 diabetes, and costing us over $100-billion per year in treatment and accommodation. Sadly, this generation of children will likely be the first in the history of Western Civilization to live less healthful and shorter lives than their parents. Despite all of this, the message from our so-called 'health authorities' is broadcast loud and clear: you are safer at home on the couch than exercising outdoors without the obligatory padding. The remote possibility of a traumatic injury trumps the overwhelming chance of a lifestyle disease, every single day of the week. They may mean well, but by fixating on the emergency room, these fear-mongering, headline-chasing ‘experts’ perpetuate a safety paradox, which makes matters much, much worse. I, for one, won’t allow my family to fall victim to this absurd and unreasonable state of affairs. If you need me, I’ll be out on the streets of Vancouver with my kids, encouraging them to cannonball, skateboard, headstand, cartwheel, and eventually, ride our plentiful bikeways wearing whatever hat they choose. Frankly, I wouldn’t have it any other way.